Few months back if someone had told me I would be relishing Butter Naans with Palak Paneer,I would have smiled and disagreed with them.I mean,is there any other combo which works well with naan other than Paneer Butter Masala? ?I doubt.I wasn't much of a Greens fan too,remember.But boy,I was wrong.Ever since I made Palak Pathrodo,I've become an instant convert and I am looking for Palak recipes like never before. For the Butter Naan,I followed Rak's recipe from Rak's kitchen,as I was looking for a recipe without yeast and which didn't require cooking in the oven/grill.I loved the ease of the recipe.The resulting naans were super soft and perfect.I did not make any changes,just halved the recipe and got around 6 naans of medium size. Sift together maida,baking powder and baking soda thrice. In a mixing bowl,add the sifted flour mix and make a small well. Pour in the milk,curds,salt and sugar and knead gently to make a smooth dough. Keep aside covered for 2-3 hours. Make even sized balls of the dough and start rolling to make an oblong shape or a tear drop shape[this is optional]. 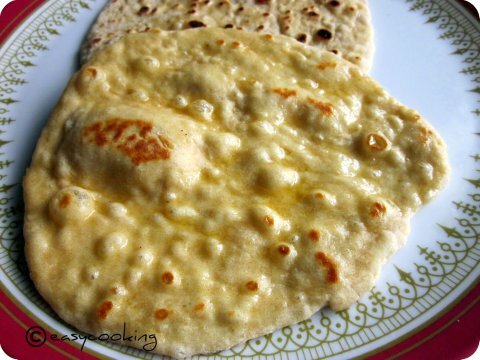 Apply few drops of water on one side of the naan and flip over to a hot tawa[so that the portion to which water was applied sticks to the tava]. Cover and cook for a minute and then flip the naan to cook/brown the other side too. Apply butter/ghee to both sides and serve hot with a curry of your choice. This looks like the perfect combo Divya!! Naan sounds easy and do-able. 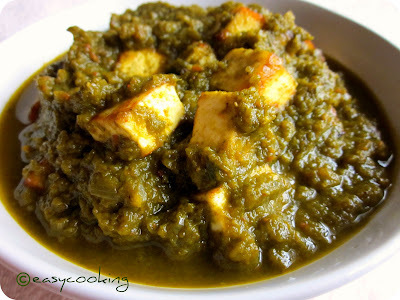 Palak paneer looka awesome and delicious divya.. perfect clicks !! thanks ..I already have my weekend menu ready..its going to be those yummy butter naans and paneer subji..already drooling..
Hey Divya akki ...i m gonna try this out... my hubby also kinda away frm greens i guess i can make him eat this ... looks yummy no doubt.... btwn ur palak patrovodo was a hit ..many of my relatives tried and asked me to thank you on there behalf ...for that lovely recepie.... !!!! Hey Divya akki ...i m gonna try this out... my hubby also kinda away frm greens i guess i can make him eat this ... looks yummy no doubt.... btwn ur palak patrovodo was a hit ..many of my relatives tried and asked me to thank you for that lovely recepie.... !!!! wow, that looks like such a drool-worthy platter. 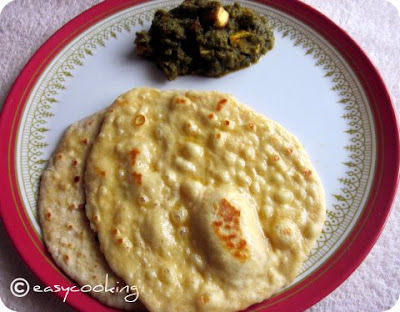 Nice..Both Palak Paneer and Naan looks delicious! Lovely combo!